Whether you’re enjoying an appetizer on game day in a team logo food Tray, or advertising your company logo at a special event, let Gator Paper bring your branded image to a whole new level. These food trays have many uses, including, serving trays, party trays, food platters, dinner trays, and many more. Our custom printed Food Trays will deliver a strong branded message to your customers. These versatile paper Food Trays are available in both white and Eco Kraft brown. With nine different sizes to choose from, our custom printed Food Trays are the perfect fit for any size food service project. Our Custom Printed Food Trays are the perfect choice for your food service presentation! How many custom printed Food Trays do I need to buy? 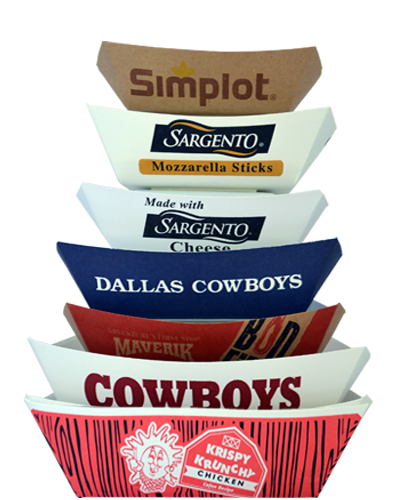 The minimum order required for custom printed Paper Food Boats is 25,000 pieces. Printed sleeves are sold separately. What is the lead time for custom printed Food Trays? Standard lead time for all custom printed Food Trays is 5-6 weeks. Food Trays can be printed with a total of two spot PMS colors. Food Trays can also be flood coated one light solid color and printed with a single darker PMS color on top. Vector art files are preferred. Adobe Illustrator, .EPS and high resolution PDF files work best. If the line artwork is simple enough, sometimes a JPEG file will work, however, Bitmap images are not good enough quality for proof or plate making, and are not accepted. Need a price quote on Custom Printed Food Trays? Contact us today! 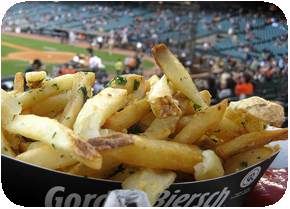 Looking for a more unique custom printed food service product? Check out our new line of custom printed Fold Top Boxes. This revolutionary new product is a great replacement for those out dated Chinese take-out boxes.